Aj ja som už pobehal Želiezovce a Žemberovce a som asi od 14.15 doma, tradične super akcia a hlásim sa na "Papierovú hvezdáreň č.6"
Uz som dioma acestou sme este s Toudim navstivili Mareka, odovzdali postu a pozreli maleho. Ďakujem za akciu, skvelú akciu! Síce som bol len na jednu noc ale úplne som načerpal atmosféru a oddýchnutý a úplne spokojný sa budem tešiť na ďalší ročník, na ktorom už budem snáď od začiatku. Pozdravujem všetkých zúčastnených modelárov a všetkým ktorý neboli môžem len odporučiť. Počasie vyšlo, spalo sa dobre, guľáš bol fajný (vlastne všetko čo sme jedli bolo skvelé), letecký deň originálny a ľudia ešte lepší! Teším sa o rok, že vraj musím prísť, Tino mi vrazil do ruky pohár putovný, že to nikto nechce, tak dík. A fotky sypte, jednu chcem určite do archlieva. A man got sick and died soon after participating in a cockroach-eating contest in Deerfield Beach, Fla., on Friday. 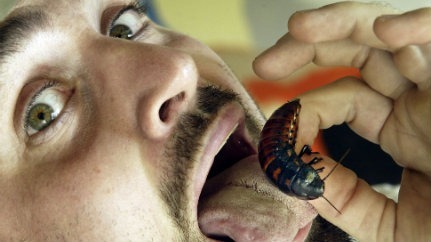 Edward Archbold, 32, collapsed and died after gobbling up dozens of live cockroaches and other insects during a bug-eating contest at a pet store. He was one of about 30 contestants in the event, which was part of a midnight madness sale at the Ben Siegel Reptile Store. It's not known what killed him. Officials are awaiting the results of an autopsy. None of the other contestants became ill.
"Our thoughts and prayers go out to Eddie's family in this terrible time. Although we just met Eddie the night of the sale, we all liked him right away," store owner Ben Siegel said in a statement issued on Sunday. "All of us here at Ben Siegel Reptiles are sad that we will not get to know Eddie better, for in the short time we knew him, he was very well-liked by all." Siegel has since refrained from commenting on the advice of his lawyer, Luke Lirot. "Some facts that have come out include the fact that all participants in the contest were entirely aware of what they were doing and that they signed thorough waivers accepting responsibility for their participation in this unique and unorthodox contest," Lirot said. "The consumption of insects is widely accepted throughout the world, and the insects presented as part of the contest were taken from an inventory of insects that are safely and domestically raised in a controlled environment as food for reptiles," the lawyer added. Mam potom u seba tu krabicu ktoru si tam nechal asi Scary. Mech sa potom ozve. Tak , tak. Pravdu vravíš.